Moisture meters are an integral part of a woodworker’s toolkit. 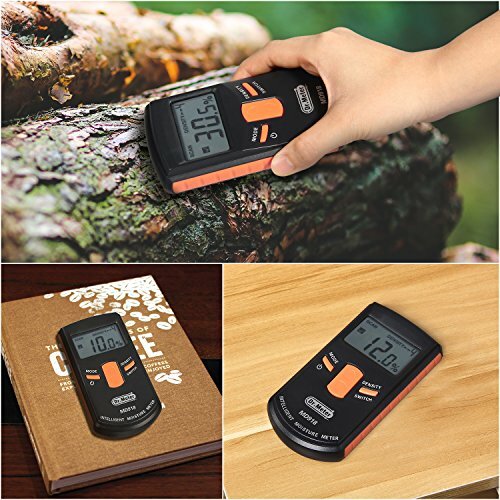 This handy device measures the moisture content in wood, so you’re able to determine if it’s stable enough for you to work with it. It also measures moisture content in soil, drywall, and even flooring. 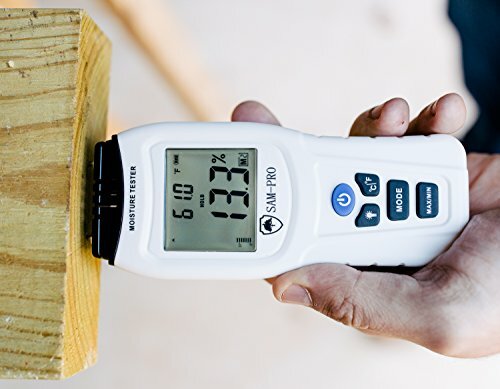 A moisture meter helps you know if your lumber is too wet or dry to use for specific home improvement, building, or other woodworking projects. Or, you can use one to detect possible sources of moisture damage in your home, such as from leaks or floods. Moisture meters come in two types: pin and pinless. A pin moisture meter measures the moisture content of wood by using two metal pins inserted into the wood. A pinless moisture meter uses a sensor pad placed flat against a board or surface to measure, so there’s no insertion involved. How a moisture meter works depends on the meter type. This differs between pin and pinless type moisture meters. 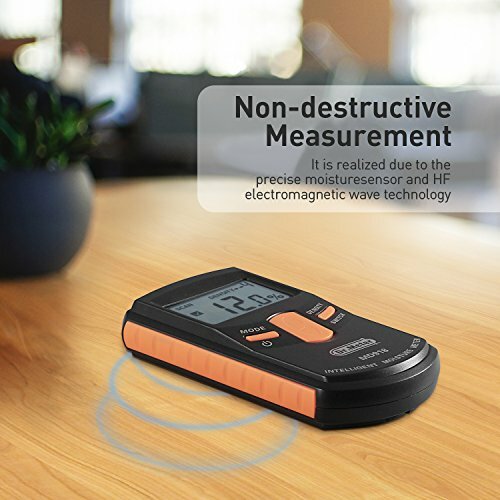 Delmhorst explains that pin moisture meters function “ by measuring the electrical resistance between two electrodes.” When moisture is present in wood, electricity flows more easily between the two prongs inserted into the wood. When the wood is dry, moisture flows less easily. Thus, a pin meter measures the resistance of electricity against the moisture content in the wood. Electricity resistance in pin meters is measured by ohms. The moisture meter then converts it into a reading you can easily understand. You don’t need to worry about interpreting what an ohm display might mean in terms of moisture content. You can encounter some difficulties in obtaining readings with standard pins, however. Sometimes the material’s thickness, or, in the case of wood, the specific species, can make it challenging to measure moisture content precisely. In that instance, consider using a slide hammer electrode for further penetration in difficult areas. Pinless moisture meters work differently than pin meters do. Rather than using prongs to measure electrical resistance, they instead use sensors. The sensors send out electromagnetic waves into the wood or surface the meter is placed against. These waves create an electromagnetic field, and from there, the meter generates a reading. Pinless meters can measure depths of up to 1.5 inches. Pinless moisture meters differ from pin meters in that they do not leave any visible marks in wood or other surfaces. Additionally, you can easily slide them along the surface to take multiple readings to check for consistency or inconsistency. How Do You Check Moisture Content in Wood? How to check moisture in wood depends on the type of moisture meter. That is, it depends on if it’s a pin or a pinless meter. With pin meters, the user inserts two prongs into the wood and waits for the meter to pick up a reading. Electricity flows between the two prongs – since water conducts better than wood, the meter determines the moisture content by measuring the current. Pin meters are sensitive to temperature variations within the wood, so pin meters always come with temperature correction charts. Pinless meters use sensor plates to detect moisture in wood or other surfaces. Simply place the meter against the wood, and you’ll gather a reading. There must be enough contact between the surface and the sensor plates. It’s not advised to use pinless meters with warped or twisted wood since you won’t be able to gather accurate readings. How Do You Use a Moisture Meter on Drywall? Measuring moisture in drywall is a little different than following the same procedure with wood. According to Delmhorst Instrument Co., there are two things you should consider in choosing the best meter for drywall: one that has a specific setting for gypsum/drywall, and the correct measurement range. Drywall is extremely vulnerable to moisture. As a result, you should look for a measurement range of approximately 0.2% to 50% moisture content. Fortunately, a large variety of meters work within this range so finding one shouldn’t be a problem. You’ll most likely use a pin moisture meter for measuring moisture in drywall. You’ll follow the same procedure by inserting the pins into the drywall and obtaining the reading. If your display indicates a high level of moisture content, we recommend testing other areas for consistent readings. If you find moisture, then you can work to identify the source and take corrective measures if needed. 1. “A Moisture Content Standard (MCS). This is an external device which is designed to provide a set reading value when the meter is used on it. If the measurement is the same as what the MCS is supposed to read, then the meter is accurate. A good point to keep in mind is that the desirable moisture content for drywall is under 1%. How Do You Measure Moisture in Soil? 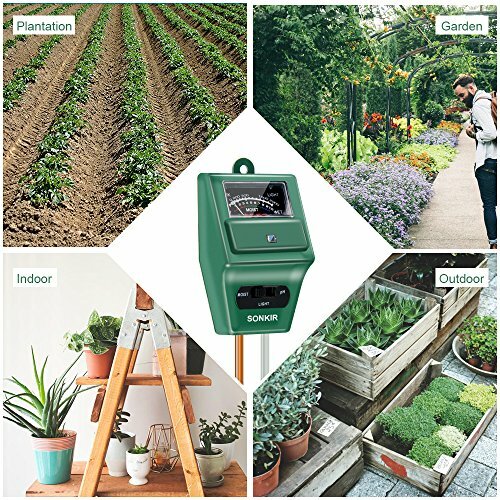 Moisture meters are usually used for measuring soil moisture in household plants. Performing such a function can help determine if you are adding too much or too little water to your plants. It can also help to pinpoint if there’s a chance of insect activity such as fungus gnats which thrive in moist environments. In this situation, you might use a pin meter so you can accurately measure the moisture content in a small, contained environment. There’s little need to use a pinless meter to scan across the soil’s surface. Farmers can also use them on a larger scale to figure out how much water their crops can absorb from the soil. Since a farmer’s livelihood depends on healthy fields, regularly monitoring field moisture allows farmers to proactively take actions on anything that might harm their fields. Or, they can simply have the peace of mind that everything is okay. For these purposes, a meter incorporating sensors is key. Why is the case? Delmhorst indicates that farmers are more concerned about the moisture that plants can absorb from the soil rather than the overall moisture content itself. The point is to gain a general sense of how things are going over a span of time rather than a detailed measurement at one point in time. How Do You Use a Moisture Meter in Flooring? Using a moisture meter in flooring is pretty straightforward. Depending on the type of flooring or subflooring, you’ll use either a pin meter or a pinless meter. For hardwood floors, you’re more likely to use a pinless meter since the sensors leave no visible marks as you don’t prick the wood with probes. On the other hand, you can easily use a pin meter with subflooring since it’s located beneath finished flooring. 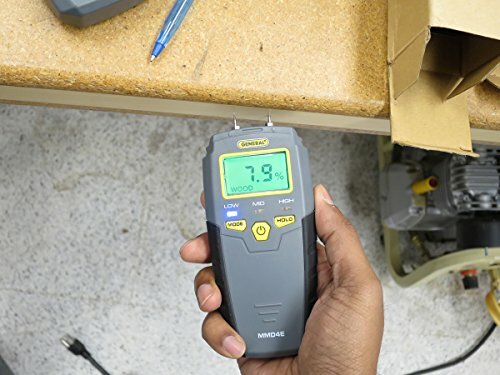 When using a pin meter to measure moisture content in flooring, you’ll first want to adjust the wood species setting on your meter (if one exists). Then, insert the prongs on the end grain on the short side or with the grain, so they’re facing the same direction. Pin meters also allow for greater accuracy. Pinless meters use sensors to measure moisture content. Simply place the meter on the surface, and the meter will do the work for you! Signal penetration for pinless meters comes in at 1 inch. Unfortunately, these tend to be less accurate than pin meters so you should use them with a thickness of more than 3/4 of an inch. With subflooring, test twenty various spots per 1000 square feet of area. Keep your meter calibrated for the most accurate results. Don’t use engineered or solid wood flooring if your subfloor moisture content is greater than 12%. Moisture meters are among the best tools woodworkers can have in their toolkits. As shown above, they can measure moisture content in a variety of places such as wood, drywall, flooring, and even soil. Fortunately, using a meter isn’t too difficult in any situation. There are just a few things to consider such as the type of meter you’re using and the type of material or surface you’re measuring. Overall, moisture meters are versatile, powerful, and extremely useful to keep around! I hope you found our How to Use a Moisture Meter article useful. Do you have any other questions about any other Moisture Meter?